Coordinates: 17°21′58″N 78°28′34″E﻿ / ﻿17.366, 78.476 Andhra Pradesh (Telugu: ఆంధ్ర ప్రదేశ్, or AP, the "Rice Bowl of India," refers to a state in southern India situated between 12°41' and 22°N latitude and 77° and 84°40'E longitude. Andhra Pradesh borders Maharashtra, Chhattisgarh and Orissa in the north, the Bay of Bengal in the East, Tamil Nadu to the south and Karnataka to the west. Andhra Pradesh stands as the fourth largest state in India by area and population, the largest and most populous state in Southern India. Two major rivers, the Godavari and the Krishna, cross the state. Historically, Andhra Pradesh has been known as Andhrapatha, Andhra Desa, Andhra-avani, Andhra-mandalamu, and Andhra-vishaya. Although Andhra Pradesh has a diverse religious scene, the state is predominately Hindu. Buddhism is present, but a minority compared to Hinduism. The same with Islam. Yet Islam has a history of political influence in Andhra Pradesh. In the mid fourteenth century, an independent Muslim state, Bahmani kingdom, was established, lasting under the Qutb Shahi dynasty for nearly two centuries from the early 1500s to the end of the 1600s. The powerful rivalry between Muslim and Hindu continued into the twentieth century. When India gained independence from Great Britain in 1947, the Muslim Nizam of Hyderabad sought to keep the state independent from union with India. The people of the state, the majority Telugu people, refused to support independent statehood. After a lengthy confrontation, including a military occupation by the Republic of India, the Telugu succeeded in creating a new Telugu state within the Republic of India, Andhra Pradesh. 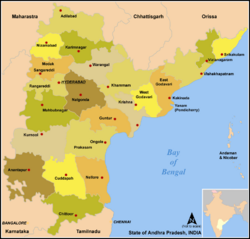 Andhra Pradesh divides into three governance regions; Coastal Andhra, Rayalaseema, and Telangana. 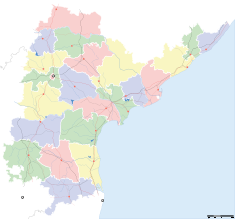 Andhra Pradesh has twenty three districts: Adilabad, Anantapur, Chittoor, Kadapa, East Godavari, Guntur, Hyderabad, Karimnagar, Khammam, Krishna, Kurnool, Mahbubnagar, Medak, Nalgonda, Nellore, Nizamabad, Prakasam, Rangareddy, Srikakulam, Visakhapatnam, Vizianagaram, Warangal, and West Godavari. 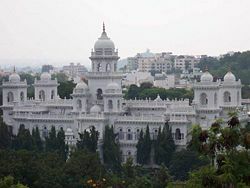 Hyderabad serves as the capital and, along with the adjoining twin city Secunderabad, has the largest population in the state. Visakhapatnam, Andhra Pradesh's main seaport, the second largest city of the state, serves as home to the Indian Navy's Eastern Naval Command. Vijayawada, located close to major rail and road routes, acts as a major trading center and has the third largest population in the state. Other important cities and towns include: Kurnool, Warangal, Guntur, Tirupati, Bhimavaram, Kakinada, Rajahmundry, Narsapur, and Nellore. Telugu represents the regional and official language of the state, spoken by 84.86 percent of the population, the second largest spoken language in India. The major linguistic minority groups in the state include the speakers of Urdu (7.86 percent), the second official language of Andhra Pradesh, Hindi (2.65 percent). The minority language speakers, constituting less than 1 percent, include speakers of Tamil (0.97 percent), Kannada (0.94 percent), Marathi (0.84 percent), Oriya (0.42 percent), Gondi (0.21 percent) and Malayalam (0.1 percent). The speakers of minority languages with less than 0.1 percent include the speakers of Gujarati (0.09 percent), Savara (0.09 percent), Koya (0.08 percent), Jatapu (0.04 percent), Punjabi (0.04 percent), Kolami (0.03 percent), Konda (0.03 percent), Gadaba (0.02 percent), Sindhi (0.02 percent), Gorkhali /Nepali (0.01 percent) and Khond /Kondh (0.01 percent). Paddy fields on the banks of river Godavari. Agriculture has been the chief source of income for the state's economy. Two important rivers of India, the Godavari and Krishna, flow through the state, providing irrigation. Rice, sugarcane, cotton, mirchi, Mangoes, and tobacco constitute local crops. Recently, crops used for vegetable oil production such as sunflower and peanuts, have gained in popularity. Many multi-state irrigation projects have been under development, including Godavari River Basin Irrigation Projects and Nagarjuna Sagar Dam, the world's highest masonry dam. Cyber towers at Hyderabad, the state capital and largest city in the state. The state has initiatives in the information technology and biotechnology fields. In 2004 to 2005, Andhra Pradesh stood in the fifth place on the list of top IT exporting states of India. The IT exports from the state came to Rs.1,800 million in 2004. The IT sector has expanding at a rate of 52.3 percent every year, exports reached Rs.19,000 million in 2006 to 2007, fourth in India. The service sector of the state accounts for 43 percent of the GSDP, employing 20 percent of the work force. Andhra Pradesh has abundant mineral deposits, ranking second mineral wealth in India. The state has about one third of India's limestone reserves, estimated at about 30 billion tons. The state ranks first nationwide in hydro electricity generation with national market share of over 11 percent. Andhra Pradesh's gross state domestic product for 2005 has been estimated at $62 billion. A chart of trend of gross state domestic product of Andhra Pradesh at market prices estimated by Ministry of Statistics and Programme Implementation with figures in millions of Indian Rupees follows. Accordingly, the state ranks third in terms of overall gross state domestic product and fourth in per capita gross state domestic product among the major states of India. The Andhra Pradesh State Legislative Assembly at the centre of the Hyderabad City. Andhra Pradesh has a Legislative Assembly of 294 seats. The state has sixty members in the Parliament of India; eighteen in the Rajya Sabha, the Upper House and forty two in the Lok Sabha, the Lower House. Indian National Congress (INC) Party had had the majority in Andhra Pradesh until 1982. Kasu Brahmananda Reddy held the record for the longest serving chief minister, broken by N.T. Rama Rao in 1983. P.V. Narasimha Rao also served as the chief minister of the state, serving as the Prime Minister of India in 1991. Notable chief ministers of the state include Tanguturi Prakasam, CM for only the Andhra state. The first Chief Minister of Andhra Pradesh, Neelam Sanjiva Reddy. Others include Kasu Brahmananda Reddy, Marri Chenna Reddy, Jalagam Vengal Rao, Nedurumalli Janardhana Reddy, Nadella Bhaskara Rao, Kotla Vijaya Bhaskara Reddy, N.T. Rama Rao, Nara Chandrababu Naidu, and Y.S. Rajasekhara Reddy. High Court at Hyderabad, the main judicial body for the state. In 1983, Telugu Desam Party (TDP) won the state elections and N.T. Rama Rao became the chief minister of the state. That marked the first time another party broke the single party monopoly of the INC on Andhra Pradesh's politics. After few months, Nadendla Bhaskar Rao attempted a hijack while Rao received mediation treatment in the United States. Upon his return, Rao successfully called for a dissolution the Assembly and a new election. The Telugu Desam Party won the elections with a large majority and Rao regained his position as Chief Minister of the State. Rao inaugurated government investment in education, rural development and prosecuting corrupt government officials. In 1989, the seven year rule of N.T. Rama Rao ended when Indian National Congress Party's Dr. Marri Chenna Reddy won election to Chief Minister. N. Janardhan Reddy and Kotla Vijaya Bhasker Reddy followed him. In 1994, Andhra Pradesh gave a mandate to Telugu Desam Party again, with N.T. Rama Rao becoming the chief minister again. Rao died of heart attack while in office. Telugu Desam Party's Chandrababu Naidu, the ex-finance minister, won a second term before suffering defeat the Indian National Congress led coalition, May 2004. Y.S. Rajasekhara Reddy of Indian National Congress, became Chief Minister of state after May 2004. Rajasekhara Reddy fought the 2004 Assembly elections in an alliance with the Telangana Rashtra Samithi (TRS), formed by the politician Chandrasekhar Rao who aimed to form a separate state. The Sanskrit epics Aitareya Brahmana and Mahabharata mention Andhra Kingdom. Inscriptions point to a kingdom in coastal Andhra ruled by Kuberaka, with Pratipalapura (Bhattiprolu) as his capital, in the fifth century B.C.E. That may have been the oldest known kingdom in Southern India. Around the same time Dhanyakatakam/Dharanikota (present day Amaravati) appears to have been important place. According to Taranatha: "On the full moon of the month Chaitra in the year following his enlightenment, at the great stupa of Dhanyakataka, the Buddha emanated the mandala of 'The Glorious Lunar Mansions' (Kalachakra)." The Mauryans extended their rule over Andhra in fourth century B.C.E. With the fall of the Mauryan Empire, Andhra Satavahanas became independent in third century B.C.E. After the decline of the Satavahanas in 220 C.E., Ikshvakus, Pallavas, Vishnukundinas, Ananda Gotrikas and Cholas ruled the Telugu land. Eastern Chalukyas ruled a length after the decline of Vishnukundinas from their capital in Vengi. As early as first century C.E., sources mention The Telugu people as vassals and chieftains under the Satavahanas and later under Ikshvakus. The battle of Palnadu weakened Chalukyan power, opening the way for the emergence of the Kakatiyadynasty in the twelfth and the thirteenth centuries C.E. The Kakatiyas became feudatories of the Western Chalukyas of Kalyani, ruling over a small territory near Warangal. In 1323 C.E., Delhi Sultan Ghiaz-ud-din Tughlaq sent a large army under Ulugh Khan to conquer the Telugu country and capture Warangal. They took King Pratap Rudra prisoner. Musunuri Nayaks recaptured Warangal from the Delhi Sultanate, ruling for fifty years. Harihara and Bukka, who served as treasury officers of the Kakatiyas of Warangal, founded the Vijayanagar empire, one of the greatest empires in the history of Andhra Pradesh and India. In 1347 C.E., Alla-ud-din Hasan Gangu established an independent Muslim state, the Bahmani kingdom, in south India as a revolt against the Delhi Sultanate. The Qutb Shahi dynasty held sway over the Andhra country for about two hundred years from the early part of the sixteenth century to the end of the seventeenth century. In Colonial India, Northern Circars became part of the British Madras Presidency. Eventually that region emerged as the Coastal Andhra region. Later the Nizam had ceded five territories to the British which eventually emerged as Rayalaseema region. The Nizams retained control of the interior provinces as the Princely state of Hyderabad, acknowledging British rule in return for local autonomy. India became independent from the United Kingdom in 1947. The Muslim Nizam of Hyderabad wanted to retain his independence from India, but the people of the region launched a movement to join Indian Union. The Republic of India forced his state of Hyderabad to become part India as Hyderabad State in 1948, after Indian Military Occupation. In an effort to gain an independent state, and protect the interests of the Telugu people of Madras State, Amarajeevi Potti Sriramulu fasted until death. Public outcry and civil unrest after his death forced the government to announce the formation of a new state for Telugu speakers. 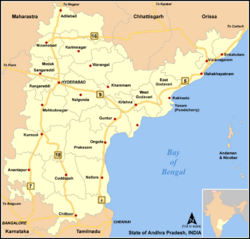 Andhra attained statehood in October 1953, with Kurnool as its capital. On November 1, 1956, Andhra State merged with the Telangana region of Hyderabad State to form the state of Andhra Pradesh. Hyderabad, the former capital of the Hyderabad State, became the capital of the new state Andhra Pradesh. Andhra Pradesh has many museums, including the Archaeological Museum at Amaravati near Guntur City that features relics of nearby ancient sites, the Salar Jung Museum in Hyderabad, which features a varied collection of sculptures, paintings, and religious artifacts, the Visakha Museum in Vizag (Visakhapatnam), which displays the history of the pre-Independence Madras Presidency in a rehabilitated Dutch bungalow and Victoria Jubilee Museum in Vijayawada, which has a nice collection of ancient sculptures, paintings, idols, weapons, cutlery, and inscriptions. The cuisine of Andhra Pradesh has the reputation as the spiciest of all Indian cuisine. Many variations to the Andhra cuisine exist, depending on caste, geographical regions, and traditions. People especially enjoy the Pickles and chutneys, called pachchadi in Telugu in Andhra Pradesh with many varieties of pickles and chutneys unique to the state. Practically every vegetable, including tomatoes, brinjals, and roselle (Gongura) comprise chutneys. The mango pickle Aavakaaya represents the best known of the Andhra pickles. Rice constitutes a staple food, typically boiled, eaten with curry, or made into a batter for use in a crepe-like dish called attu (pesarattu) or dosas. People prepare different masalas into a variety of strongly flavored dishes using Meat, vegetables, and greens. Muslims, who arrived in Telangana in the fourteenth century, influenced Hyderabadi cuisine. Much of the cuisine uses lamb, chicken, and fish, rich, and aromatic, with a liberal use of exotic spices and ghee, as a primary ingredients. The biryani represents the most distinctive and popular of Hyderabadi dishes. The dance of Andra Pradesh has an ancient and proud history. Desi and Margi forms have folk dance forms like Perani, Prenkhana, Suddha Nartana, Carcari, Rasaka, Danda Rasaka, Shiva Priya, Kanduka Nartana, Bhandika Nrityam, Carana Nrityam, Chindu, Gondali, and Kolatam received treatment. The folk dance's most popular forms are Tandava and Lasya, Natya and Nritta, Angi-kabhinaya, Caris, Sthanakas, Mandalas, Karnas, Angaharas, and Recakas. Among the local dance forms, desi nritya stands out. Although both men and women perform classical dance in Andhra, women tend to learn it more often. 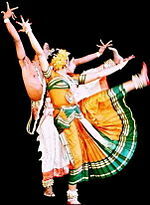 Kuchipudi stands as the state's best-known classical dance forms of Andhra Pradesh. The various dance forms that existed through the states’ history include Chenchu Bhagotham, Kuchipudi, Bhamakalapam, Burrakatha, Veeranatyam, Butta bommalu, Dappu, Tappeta Gullu, Lambadi, Bonalu, Dhimsa, and Kolattam. Sanskrit literature and Hindu scriptures highly influenced Telugu literature. Nannayya, Tikkana, and Yerrapragada form the trinity that translated the great epic Mahabharatha into Telugu. Bammera Potana, another renown poet from Orugallu (Now Warangal), became famous for his great classic Sri Madandhra Maha Bhagavatamu, a Telugu translation of 'Sri Bhagavatham' authored by Veda Vyasa in Sanskrit. Nannayya derived the present Telugu script (lipi) from the old Telugu-Kannada script. Emperor Krishna Deva Raya wrote Amuktamalyada and also made the famous statement: "Desa Bhashalandu Telugu lessa." Philosophical poems by Yogi-Vemana have become famous. Modern writers include Jnanpith Award winners Sri Viswanatha Satya Narayana and Dr. C. Narayana Reddy. Revolutionary poets like SriSri and Gaddar have won a wide popular following. Mohammad Quli Qutub Shah stands as the first Deewan Shayar of Urdu Literary History. Makhdoom Mohiuddin has been regarded as revolutionary poet. Many classical writers have been prolific, like Wali Mohammed Wali Dakhni, Amjad Hyderabadi, Charagh Hyderabadi, Aqeel Hashmi, Suleman Athhar Javed, Aslam Farshori, Ahmadnisar, Barq Kadapavi, and Qamar Ameeni. The state has a rich musical heritage. Legends of the Carnatic music (that started during Vijayanagara Dynasty's Sri Krishna Deva Raya) Trinity - Thyagaraja have Telugu roots. Other well-known composers include Annamacharya, Kshetrayya, and Bhadrachala Ramadasu. Telugu film (called Tollywood) music has increased in popularity. Folk songs have traditionally been popular in the rural belt. More than twenty universities serve Andhra Pradesh. They offer a wide array of programs in the arts, humanities, science, engineering, law, medicine, business, and veterinary science. Graduate programs conduct research in most major areas. Andhra Pradesh has 1330 arts, science, and commerce colleges, 238 engineering colleges, and 53 medical colleges. The student to teacher ratio stands at 19:1 in the higher education. According to census taken in 2001, Andhra Pradesh has an overall literacy rate of 60.5 percent. While male literacy rate hits a high water mark of 70.3 percent, the female literacy rate has attained a lesser 50.4 percent. The state has recently focused on creating several institutes of high quality. International Institute of Information Technology (IIIT) and Indian School of Business (ISB) have been gaining international recognition for the quality of their programs. National Institute of Fashion Technology, Hyderabad (NIFT) has earned a top reputation among those seeking in a career in fashion. Among the most outstanding universities in Andhra Pradesh: National Institute of Technology NIT and the University of Hyderabad. Andhra Pradesh hosts numerous religious pilgrim centers. Tirupati, the abode of Lord Venkateswara, stands as most visited religious center in India. Srisailam, the abode of Sri Mallikarjuna, numbers among twelve Jyothirlingalu in India, Amaravati's Siva temple represents one of the Pancharamams, and Yadagirigutta, the abode of an avatara of Vishnu, Sri Lakshmi Narasimha. 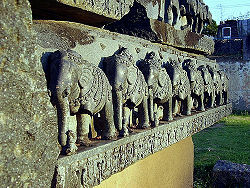 The Ramappa temple and Thousand Pillars temple in Warangal have won fame for fine temple carvings. The state has Buddhist centers at Amaravati, Nagarjuna Konda, Bhattiprolu, Ghantasala, Nelakondapalli, Dhulikatta, Bavikonda, Thotlakonda, Shalihundam, Pavuralakonda, Sankaram, Phanigiri, and Kolanpaka. The golden sand beaches at Visakhapatnam, the one million year old limestone caves at Borra, picturesque Araku Valley, hill resorts of Horsley Hills, river Godavari racing through a narrow gorge at Papi Kondalu, waterfalls at Ettipotala, Kuntala, and rich bio-diversity at Talakona, constitute some of the natural attractions of the state. The Borra Caves sit in the Anatagiri Hills of Eastern Ghats, near Vishakapatnam, Andhra Pradesh State in India. Famous for stalactite and stalagmite formations, the caves nestle into hills at a height of 800 to 1300 meters above Mean Sea Level. William King George, a British geologist, discovered them in the year 1807. The caves get their name from a formation inside the caves that looks like the human brain, borra in Telugu. Similarly, erosion in limestone deposit in the area by Chitravati River millions of years ago formed the Belum caves. Those limestone caves formed from the action of carbonic acid—or weakly acidic groundwater. The groundwater formed from the reaction between limestone and water. 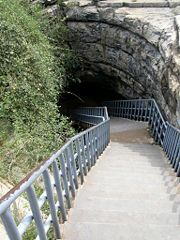 Belum Caves, the second largest cave in Indian sub-continent and the longest caves in plains of Indian Subcontinent, derives its name from the Sanskrit word, "Bilum," for caves, Belum Guhalu in Telugu. Belum Caves measures 3229 meters in length, making it the second largest natural caves in Indian Subcontinent. Belum Caves have long passages, spacious chambers, fresh water galleries and siphons. The caves reach its deepest point (120 feet from entrance level) at the point known as Patalganaga. Horsley Hills, a famous summer hill resort in Andhra Pradesh about 160 km from Bangalore, India and 144 km from Tirupati, sits at an elevation of 1,265 m. The town of Madanapalle lies nearby. Major tourist attractions include the Mallamma temple and the Rishi valley school. Horsely Hills serves as the departure point for the Koundinya Wildlife Sanctuary 87 km distance. Horsley Hills had been named after a British officer named W.D. Horsley, the Collector of Cuddapah district, who chose that spot for his summer residence. Dense growths of eucalyptus, jacaranda, allamanda, and gulmohar trees line the narrow road to Horsely Hills. Charminar, Golconda Fort, Chandragiri Fort, Chowmahalla Palace and Falaknuma Palace number among the important historical sites in the state. Hyderabad (Rajiv Gandhi International), Visakhapatnam, Vijayawada (Gannavaram), Rajahmundry (Madhurapudi), and Tirupati (Renigunta) constitute the Six airports in the state. Government also have plans to start airports in six other cities including Nellore, Warangal, Kadapa, Tadepalligudem, Ramagundam, and Ongole. The government of Andhra Pradesh operates the Andhra Pradesh State Road Transport Corporation (APSRTC), the major public transport corporation connecting all the cities and villages. APSRTC also has the distinction of being in the Guinness book of World records for having the largest fleet of vehicles, and the longest area covered/commuted daily. Apart from those, thousands of private operators run buses connecting major cities and towns of the state. Private vehicles like auto rickshaws occupy a major share of the local transport in the cities and adjoining villages. Andhra Pradesh also has two of the major ports of India at Visakhapatnam and Kakinada and two minor ports Machilipatnam and Krishnapatnam. ↑ S.S. Ramachandra Murthy, A Study of Telugu Place Names: Based on Inscriptions from the Earliest to the 13th Century (Delhi: Agam Kala Prakashan, 1985), p. 10. ↑ Blonnet, AP Cabinet approves four regional planning boards. Retrieved August 14, 2008. ↑ Agri.ap.nic.in, Agriculture dept. of Andhra Pradesh. Retrieved August 14, 2008. ↑ Andhra Pradesh Government, Key Sectors of Andhra Pradesh. Retrieved August 14, 2008. ↑ AP Assembly Live, Andhra Pradesh Legislative Assembly. Retrieved August 14, 2008. ↑ Helmut Hoffmann, "Buddha's Preaching of the Kalachakra Tantra at the Stupa of Dhanyakataka," in F. Max Müller, German Scholars on India: Contributions to Indian Studies (Varanasi: Chowkhamba Sanskrit Series Office, 1973), p. 136-140. ↑ Domingos Paes, Fernão Nunes, and Robert Sewell, A Forgotten Empire: Vijayanagar: A Contribution to the History of India: Chronica dos reis de Bisnaga (Teddington: Echo Library, 2006). ↑ Je Varalakṣmi, Splendour of the Classical Dances of Andhra Pradesh (Delhi: Kalpaz Publications, 2007). Busi, Bhaskar Rao, and K. Ravi. 2006. Anthropological Studies in Andhra Pradesh: An Appraisal. Kolkata: Anthropological Survey of India, Ministry of Tourism and Culture, Govt. of India. OCLC 77714007. Galab, Shaik. 2006. Livelihood Diversification in Rural Andhra Pradesh: Household Asset Portfolios and Implications for Poverty Reduction. London: Young Lives, Save the Children UK. ISBN 9781904427353. Knox, Robert. 1992. Amaravati: Buddhist Sculpture from the Great Stūpa. London: Published for the Trustees of the British Museum by British Museum Press. ISBN 9780486276366. Müller, F. Max. 1973. German Scholars on India: Contributions to Indian Studies. Varanasi: Chowkhamba Sanskrit Series Office. OCLC 1499942. Paes, Domingos, Fernão Nunes, and Robert Sewell. 2006. A Forgotten Empire: Vijayanagar: A Contribution to the History of India: "Chronica dos reis de Bisnaga." Teddington: Echo Library. ISBN 9781406804607. Ramachandra Murthy, S.S. 1985. A Study of Telugu Place-Names: Based on Inscriptions from the Earliest to the 13th Century. Delhi: Agam Kala Prakashan. OCLC 12667687. Rao, R.S., V. Hanumantha Rao, and En Vēṇugōpāl. 2006. Fifty Years of Andhra Pradesh: 1956-2006. Hyderabad: Centre for Documentation, Research, and Communication. OCLC 145733286. Shankaranarayana Rao, A. V. 2001. Temples of Andhra Pradesh. Bangalore: Vasan Publications. OCLC 191822473. Talbot, Cynthia. 2001. Precolonial India in Practice: Society, Region, and Identity in Medieval Andhra. Oxford: Oxford University Press. ISBN 9780195136616. Varalakṣmi, Je. 2007. Splendour of the Classical Dances of Andhra Pradesh. Delhi: Kalpaz Publications. ISBN 9788178355078. World Bank. 2006. Overcoming Drought: Adaptation Strategies for Andhra Pradesh, India. Washington, DC: World Bank. ISBN 9780821366646. This page was last modified on 20 March 2016, at 19:01.